People have at least a basic idea of what is involved in getting a business to rank visibly in local search if they’ve talked with me for a few minutes or have been to this site or others that deal with local search. Or, to the extent they’ve done some “homework,” they may have a very solid understanding of what the main moving parts and to-dos are. But the question of how long a local SEO campaign takes doesn’t get nearly as much attention, and fewer people have even a rough idea of the answer. That’s why recently I asked some of my fellow local-search aficionados how long it takes them to help get their clients visible in local search. I asked the above people 3 specific questions about “how long local SEO takes.” And boy did they answer (as you’ll see in a second). Their commentary – though superb – does not make this a “scientific” post. There’s no such way to answer this question (or many other local-search-related questions, for that matter). Rather, I wanted to know: to what extent is there a consensus – among people who do this stuff all day long – as to how long it takes to get good (typically first-page) local rankings? Do you want the shortest of short answers – the “consensus” in a pistachio-sized nutshell? Well, here you go: local SEO usually takes anywhere from a month to a year. If all you wanted was a rough number, you just got it. But settling for that is like going to a 5-star steakhouse and only eating the bread. Plus, rough numbers don’t give you a sense of the particulars – like how much time it might take in your situation for your business to get more visible in local search. 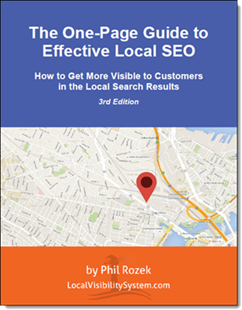 So, if you’d like the insights from thousands of man-hours and woman-hours of local-SEO experience, read on. Question 1: When a potential client asks “Roughly when can I expect to see results?” what is your typical answer? “1st I’ll optimize your Google+ Local page. For 2nd tier keywords like ‘[city] teeth whitening’, ‘[city] dental implants’, ‘[city] laser dentistry’ we can usually get significant results in less than a month because those keywords I can typically impact when I optimize your Place page. (That’s if they didn’t already have those KWs in G+ Local categories.) Most of my clients move right up to page one, but of course there are no guarantees and it depends on the competition in your market for each of those keywords. “For your core keywords like ‘[city] dentist’ and ‘[city] cosmetic dentistry’ – just optimizing the Place page normally won’t move the needle, as those keywords are the most competitive. To impact ranking for your core keywords will take the on-site Local SEO and Local Hooks changes I need to do. After those changes are complete we normally start to see an improvement in about a month. But then rankings can gradually improve for awhile after that. “‘It depends’, of course, as you already acknowledged 🙂 If it’s a client in a fairly non-competitive industry who’s never done ANY optimization (e.g. claimed many listings, added custom categories to their +Local page, has no optimized Title Tags on their website), I’ve seen some substantial results in two or three weeks. Clients in competitive industries who need to start review campaigns, dramatically revise their site architecture (for multi-location businesses), etc., it’s going to take considerably longer. “Somewhere in the 6 month range, give or take some months. A. Starting point. Where is the client subject to competition? B. What is the status of existing citation/ NAP information on the web. Clean or not clean? Question 2: When your local-SEO efforts go smoothly for a given client, how long does it usually take for his/her business to reach the local rankings you set expectations for? “Well, I never promise any rankings. I try to give people a realistic assessment of where they are based on the point they’re starting from and the market they’re in. “For a client starting from dead scratch with a brand new website and brand new location, four-six months is realistic. I recently went through this exercise with my cousin’s group health insurance agency and she has just started to rank well across a broad range of terms (health benefits portland, group insurance portland, etc) after a full-on launch and citation campaign starting in March. Everything here was very smooth obviously since there were no NAP conflicts and I was in complete control of the process. “Funny you add ‘smoothly.’ Clearly you added this because so often Google Local throws us ridiculous, illogical curveballs. Promises are often mistaken for guarantees…and in my cautious opinion, SEOs should not be making ranking guarantees. Way too many variables, bugs, etc. Question 3: For the “trouble cases,” when things don’t go so smoothly, how long does it usually take for your client to get the rankings you expected? “Short answer 6 months, but it really depends on their budget and/or if they are willing and able to do a lot of the NAP cleanup (with my instructions). Updating directory listings can take an unexpectedly long amount of time, especially if they have been careless with setting up accounts, recording log ins, etc. I have cleaned up unbelievable multi-location messes in 3-4 months, but it was with a big budget. A HUGE thanks to all the great local SEO-ers who offered their time and first-hand knowledge. Each of them is worth following and learning from (or even hiring) if you want to get some more local-search visibility for your business. What’s been your experience so far, in terms of how long local SEO “takes”? Leave a comment!